Some months ago I realized the AmTrak station in Centralia was just a block from a McMenamins. I made a plan to take the train for a sketch outing there. I've not been on an AmTrak train since I was a teenager so I thought it would be a new experience. Yesterday I finally got around to it. A couple sketching friends came with me. The first half hour of the trip I was alone, Tukwila to Tacoma. I sketched the woman sitting across from me. 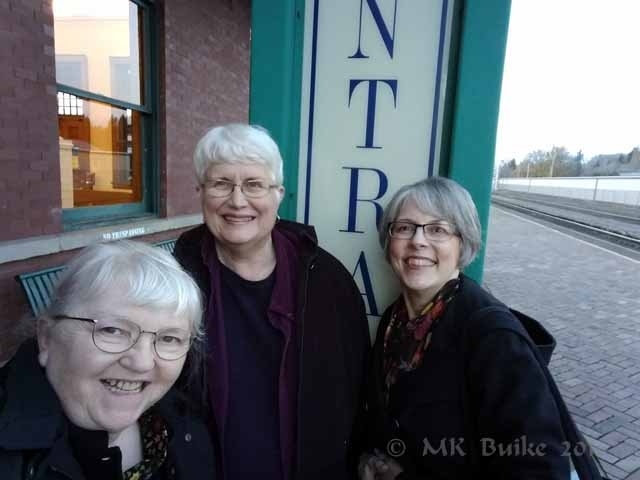 Then I met up with my traveling companions at the Tacoma station. 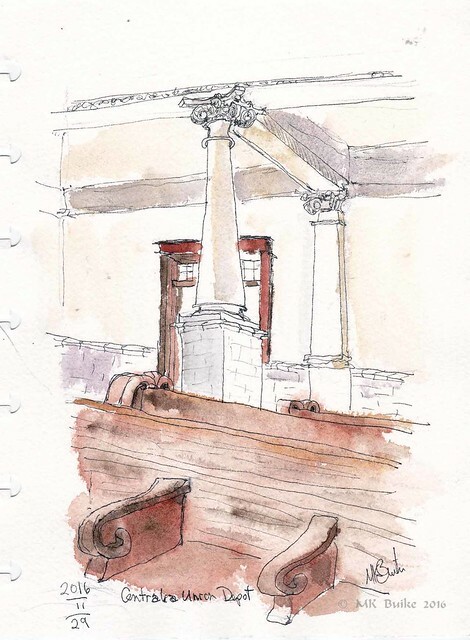 First, we sketched in the old fashioned train depot. It was small but had the Victorian era details. It was built in 1912, a bit out of the Victorian period but it still has the details. Then on to the McMenamins Olympic Club hotel. If you don't know about McMenamins, they are a hotel and restaurant company that buys historic old buildings and renovates them into amazing venues. They serve the communities in which they reside by opening their facilities to the public. The locations often have a movie theater or a pool, or both, and these are available for the public to use. All of the locations are unique with art, painting and decor related to the area in which they reside. Each of them is eminently sketch-able! 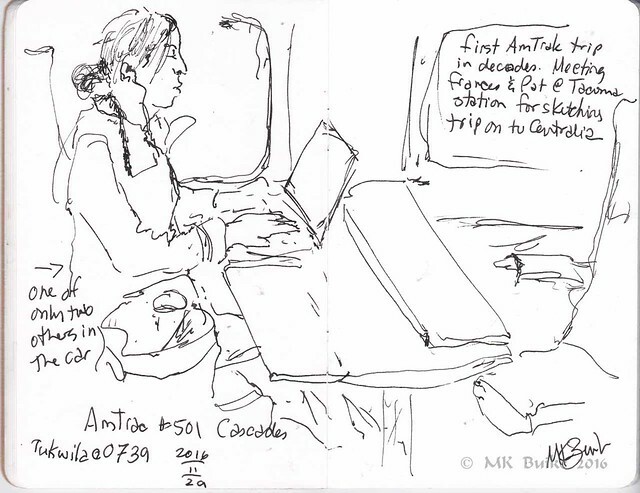 We've sketched 2 or 3 times at the Six Arms on Capitol Hill, Seattle. From the website: "Our goal is to keep the past in the present, to celebrate and connect us all with the people and events that have helped define each McMenamins property. To that end, we research, interview and compile materials to identify and commemorate our properties and their surroundings. Our best historical finds often come from you!" 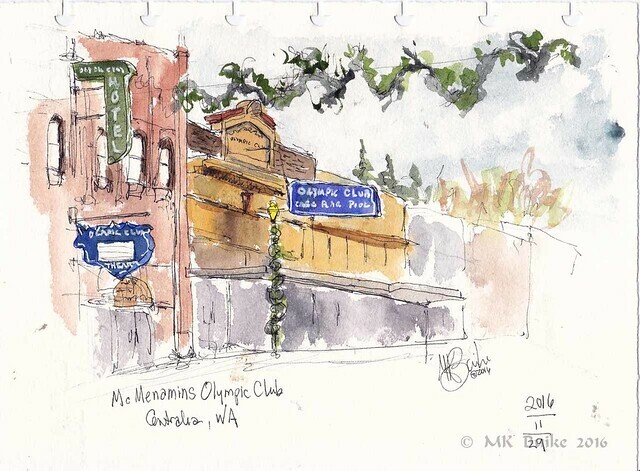 It was predicted we would have rain in the afternoon so I made my first sketch of McMenamins outside. This is the view from the street. The greenery is hung for holiday decor. 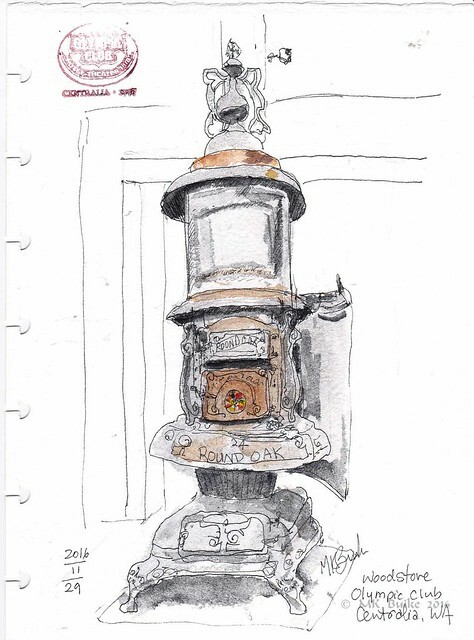 After sketching outside for about an hour, I was happy to sit by the wood stove to warm up. This heats the dining and pool rooms! There was a large stack of wood next to it. We had our lunch there and shared the sketches we'd done so far. My final sketch was of the large sign in the "New Tourist Bar". 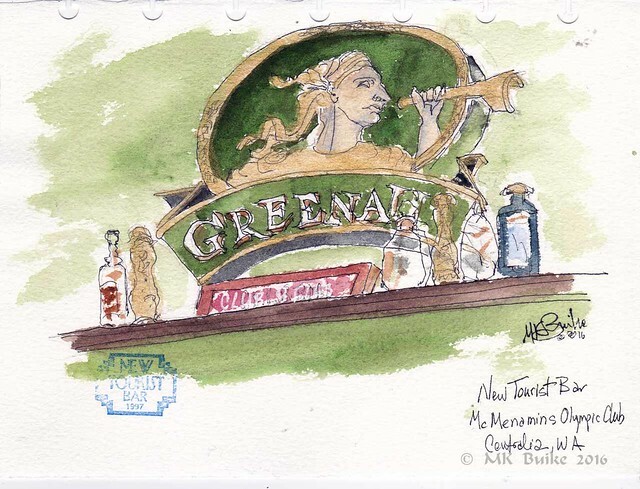 I didn't know it at the time, but Greenalls is a brand of gin. All of the staff of the Olympic Club were delightful. I was allowed to go into the hotel section in order to complete the scavenger hunt and get another stamp for my McMenamins Passport book! And they stamped our sketches too! 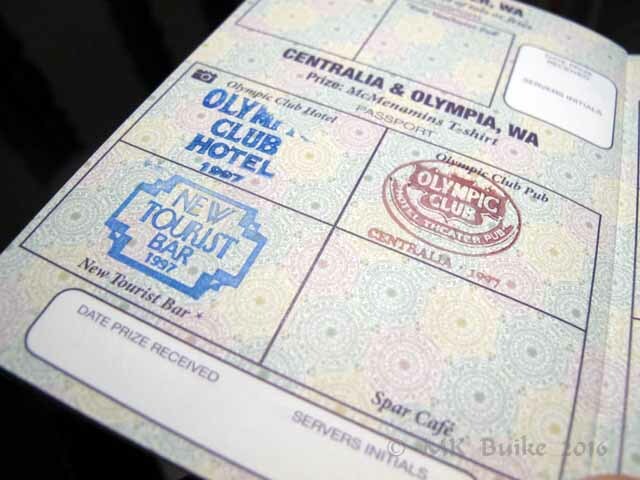 Now I'm planning a trip to the Spar Cafe in Olympia to get that last stamp in the section! This will be a drive, though. I checked into going by train: in addition to the travel time by train, it is an hour bus ride from the station, which is actually in Lacey! I only takes me an hour to just drive there. Love these sketches! And the commentary! Quite an adventure by the looks of the sketchers. Good companions too! Kate, this is a lovely collection of sketches! What is the Scavenger hunt? A Seattle USK thing? You should be proud of this collections! Thanks. It was following a clue at the check in desk to find an object in the hotel, take a photo as proof of find, show to front desk staff for another stamp in my Passport. Centralia has a surprising number of interesting sketch opportunities, doesn't it. There's a holiday tractor parade this coming Friday. I'm hoping to go. Let me know if you come down to Olympia and go to the spar. I'll meet you there if you like and I'm around. It's pretty cool but I liked it better when the previous owners had it - a bit more authentic. Kate - this was such a cool idea! I didn't realize that McMinamins had taken over the Spar - it was a great place with WONDERful milkshakes - hope they still have those! the passport is intriguing - and so fun to have on your sketch as a memory of where you were! You are very intrepid - thanks for your great train idea!